Why Am I a ‘Habit-Monster’? The ‘D’ speech came to life in August 2016. 9 months. Every morning. 1/2 hour writing. 1+ hours on weekends. Another 1/2 hour daily practicing starting in February. That’s 250+ hours spent creating this speech. Why? Why spend so much time? Pain. Sheer, excruciating, unadulterated pain. “The Tape” above is my brain’s daily dialogue from late 2007 – early 2009. I can take a punch to the face. I can absorb a kick in the gut. I can survive a hard slam. I can not live with the pain of depression. I can not stand to see the impacts on families. I can not imagine how difficult life is with severe depression. My depression was mostly mild to moderate, lasted about one to two years, and was easy for me to recognize. From my painful childhood experiences, I knew what was happening. I’d never been depressed. When my brain played “The Tape” above on non-stop repeat, I knew something was wrong. I could feel my brain was a broken circuit. I had trained it to think negative thoughts, constant chatter, day and night. In retrospect, I know that my under-active thyroid played a huge role. I was always introverted, maybe a little melancholy – more pensive than sad. That made me predisposed to getting stuck in my own head. Under-active thyroid commonly leads to “brain fog” and often depression. Working as a Software Engineer, I could feel the “brain fog” daily. Trying to understand conversations on XML parsing algorithms with a 5-second buffer delay as my brain tried to catch up is a recipe for feelings of inadequacy in my world. I wanted to rip my hair out. Even with an introverted, melancholy pre-disposition, I was relatively even-keeled and optimistic. Counting the seconds, minutes, and hours overnight as my mental anxiety loop replayed “The Tape” on repeat each night from 11 pm – 7 am was debilitating. Waking up each morning, not knowing whether you slept a minute or not, is demoralizing. Watching the faces of those you care about try with all their might try to help you and nothing working is dehumanizing. It’s also inspiring. I was diagnosed as hypothyroid around 2006, a couple years after graduating college. I didn’t think much of it at the time. I was already managing diabetes and thought: “Another auto-immune disease…so what?” Before I was diagnosed, the Physician’s Assistant at my doctor’s office talked to me about anti-depressants. She noticed I was a bit “melancholy”. She wasn’t trying to subdue me with drugs. She wanted to educate me on my options. I declined the meds. I don’t like taking medication unless it’s required, meaning it dramatically improves the quality of my life. Take insulin, for example. If I was born one-hundred years ago, I would have been dead at fourteen. Not a great quality of life. Insulin = required. A new endocrinologist diagnosed my thyroid issues. She placed her hands around my Adams-apple, near where your thyroid is located. “Hmmm?” she murmured. She ordered the TSH test immediately. The tests results were clear. My TSH was over 10. Over ~4 and you’re considered hypothyroid. TSH is thyroid stimulating hormone, meaning this is the hormone your body produces to stimulate your thyroid to produce more of the hormones you need to function normally. Those hormones regulate many aspects of your metabolism and brain functioning. A high result means your pituitary gland is signaling your body extra hard to make more hormones because you don’t have enough. My endocrinologist said that this deficiency wouldn’t change. I was hypothyroid. I would need medication for the rest of my life. I started taking Synthroid. I didn’t question anything. I felt relatively normal but trusted the doctor’s assessment. Then, my Mom died. A lot of people think highly of their Moms and we should. My Mom was “a saint”. That’s what we called her. Anyone who deals with my Dad for over forty years gets a special title. What really made my Mom a saint was her ability to make you feel like the only person in the world that mattered. She was a talker. She lit the house on fire one night because she didn’t pay much attention to dinner. She was talking on the phone. She was always on the phone. Or walking a Mummer’s strut down the street to talk to a friend. That was her normal walk. I’ll write more on my Mom, but what’s most important here is that she was the glue in our family. She managed the conflict between my brother and Dad as best as she could. I lived with all four of them in a house in Lansdowne, PA. It was too small for all of our personalities. I was a bit down. My brother was a bit down. My Dad was clearly depressed. My Mom was the upbeat one, always positive, always smiling, always talking. Then, she died. That house was no longer a good environment. It took me a while to recognize that. We had two dogs and eight puppies at the time. Excrement everywhere. Some say “you are the average of the five people you spend the most time with.” We don’t get to choose our family. We may stumble into relationships with many friends. We choose how much time we spend with each of them, whether we realize it or not. I’m happy with my choices and life’s choices for me. I am my mom, my dad, my brother, my sister, and Bria. In my life so far, they’re my five. Round it out with great friends, training partners, martial arts teachers, professional mentors, and I have a pretty good group to draw upon in times of trouble. Not once did they fail me when I was down. I’ll take my averages. I got lucky stumbling into Bria my first day full-time at Siemens. Thank goodness she needed help finding the Post-It notes. Fast forward five years and living with a depressed person is hard. Living with this hermit is hard enough when I’m at full-strength. Starting to live together because one person is depressed and needs help is a sacrifice many relationships don’t survive. How she put up with me is her story. I’m just grateful for her. And I’m grateful for my family and friends. Every day I’d pick someone to call, knowing their voice would make the day a bit more bearable. I called Kevin Colgan from work many times. “Hang in their buddy…” he’d say. “Everything is gonna be alright. Just keep training and stay focused on what you can control.” Little bursts of Stoicism years before I could recognize it. I called everyone and every time I received support, compassion, and understanding. They encouraged me to take action, never judged me in my moments of truth. That’s the environment to heal. I grew up in the opposite environment, but strangely that helped me too. I was motivated to fix the problem. I didn’t know how to do it but I didn’t want to end up like my dad, resigned to a mentally crippled life. I love my Dad. He was a funny guy. He looked at the world differently, a bit askew. He didn’t mind being different. He either didn’t care what you thought or pretended not to with the rough shield he used to defend himself against any attacks. We learned how to argue in my house. We learned how to argue under emotional duress. In our world arguing was a survival technique for your psyche. We didn’t have the brawn to beat my Dad until we were older. We had the brains. We used what we had. Sometimes, it got physical. That’s not my story. I had to break up some fights. My friends and I joked about us having the cops on speed dial or the cops knowing us by our first name. Those were jokes, bad jokes to cope. That’s what you do afterward. You cope, find a way to get by. We leaned on each other. We talked about my Dad. We wanted him to get help. Desperately. Therapy, meds, whatever. He didn’t want any of it. He thought meds “made him a different person.” Meds change you. I can’t argue with him now. Sometimes, they change you for the better. I don’t know his experience. I only know that when we had a rough night, my sister would say, “Mom, did you forget to give Dad his Prozac again?” My Mom slipped Prozac into my Dad’s coffee every morning. Sometimes, she forgot. I can’t remember much on his arguments for not going to therapy, other than he had a strong aversion to it. I remember phrases like “What do you think I’m a PSYCHO?” He said it in a way, that made you feel like you were evil for even suggesting it. It was an emotional reaction. He had his beliefs. They were set. You would not crack his shield. This is why my speech isn’t targeted at depressed people. I believe the best thing we can do to help is to create the right environment for people to get help before they’re depressed. Once they’re depressed, their beliefs might be set. They may not be willing to get any help. Even if their beliefs are not set, they may make an emotional decision if you press them to get help. No one likes to be told what to do. Their first gut reaction, when forced into a corner, may be to reject the idea. Then, they have to stand behind that decision. That’s a hard battle to fight when you care about someone who’s depressed. I’d rather not have to fight it. I’d rather create the right environment where depression is a normal topic of conversation ahead of time, even if it seems like there’s no reason to do it. By the time there is a reason, it may be too late. Even if their beliefs are not set, they may make an emotional decision if you press them to get help. No one likes to be told what to do. Their first gut reaction, when forced into a corner, may be to reject the idea. Then, they have to stand behind that decision. That’s a hard battle to fight when you care about someone who’s depressed. I’d rather not have to fight it. I’d rather create the right environment where depression is a normal topic of conversation ahead of time, even if it seems like there’s no reason to do it. By the time there is a reason, it may be too late. My beliefs were already set. Depression will reduce you to a ghost of your potential. I wouldn’t live like that. I wanted to get back to normal for me. Pure selfishness in all the right ways. I called a therapist. I took the depression survey. I tried med after med after med. Even with my beliefs set and motivation clear, the actions I took still weren’t easy. These three moments of truth stand out because they made me pause. Acting in each moment felt like I was changing who I was. That first moment of truth was calling the therapist. An inner voice said, “Alright, this is it. You’re acknowledging you’re depressed.” Behind those statements was a mountain of pressure. Seeing my Dad fight back against going to a therapist my whole life, I wondered “What’s so bad about therapy?” Nothing. Nothing real except what we imagine in our heads, the stories we tell ourselves, the stories we hear from other people. I know that now. I didn’t know it when I made the call. The story goes: If you go to a therapist, you’re crazy, insane, depressed – for life. That’s the #ScarletD. Like Puritan adulterers in colonial times, society brands anyone who goes to a therapist or takes an antidepressant med with the #ScarletD. Society is too vague, too broad, too detached because society is us. Each of us who unconsciously attach the ‘D’ label to our family, friends, and co-workers for life. We’re not bad people. We’re programmed to think this way. That’s our environment. Depression is taboo. It’s hard to remove a label from someone when you can’t talk about the topic long enough to understand it. Let’s talk. Steffi’s office was a picture of calm. Warm lights. Soft couch. Face to face. Steffi was my therapist, a trained psychologist with curly black hair, a controlled big smile, and a heart of gold. I believe she held back on the smile to not overwhelm me with her positive energy. I might not have been able to handle it in my weakened, negative state. She had to coax the positivity back out of me. When I started going to Steffi, I sounded like the guy from the Micro Machines commercials. I didn’t wake up one day, magically recovered. It was hard work, every day. What I looked forward to most during those six months of recovery was going to the therapist’s office. Every Wednesday night I knew for one hour I would not be judged. I had a coach to help me make sense of my world again. Every Wednesday night when I left, I wished I could fast-forward a week to the next meeting. Instead, I tackled Steffi’s homework. I can’t remember why I filled out my first depression survey. I was online, all the time. At work. At home. Everywhere in between. I was trying to figure out how to regulate my thyroid. I wasn’t sure how big of a force that played in my depression at the time, but I suspected it was a major factor. Maybe, I was curious about the survey when I was it online. 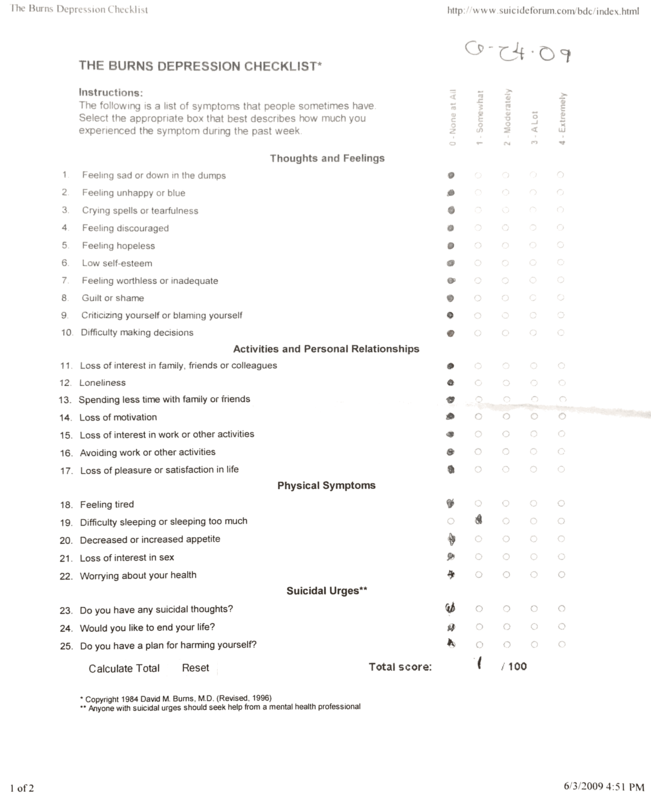 Maybe, my therapist asked me to fill it out to give me more confidence as I improve. What I know is that it helped. At my peak I started at the very low end of severe depression. This was at the peak of my insomnia. I was beyond my wit’s end. I fell down the rabbit hole on a one-way trip through a filter of speedy visuals, slow-moving sounds, adrenaline-filled anxiety, and lethargic inertia. Week by week, I battled back. Over six months my survey scores progressed relatively linearly from moderate to mild to non-existent depression. My final score was 1. I still had a little trouble sleeping. The two bookend surveys hide a struggle. Each day was a new chance to heal. But each day I started with an albatross around my neck from racing thoughts, pulsing meds, vanishing dreams. As a wise man once said, “Life…is how much you can take…how hard you can get hit and keep moving forward.” In the ring of fighting, I knew myself. In the ring of life, I was just getting started. I don’t like meds. When they first taught me to use insulin, the nurse showed me how to inject a needle into an orange. My redirect didn’t work. I learned to deal with the needle. Life with an insulin pump is much easier. I eat a lot. As a Type I diabetic, you need an injection almost every time you eat. If you eat six times per day, that’s six needles. That hurts. With an insulin pump, I switch my infusion set every two to three days. A needle goes in. A needle comes out and I’m left with a small plastic tube inside. Much more comfortable. Now I was taking Synthroid on top of insulin, which I later switched to Armour Thyroid preferring the pig gland over the synthetic version. I wasn’t happy to add another med to the mix, but when you’re missing major hormones you get over it. Depression meds were different. what if I could fix depression without the meds? More hard decisions on depression meds. Who will I be after taking this pill? Is this the right one? Will I ever sleep? That last question was the key question for me. I like to imagine that I’m a tough guy. I can handle anything. I can outlast any pain. That might be true with depression, but how many years would I waste trying to fix the issue. By the time I asked this question I was already taking meds to sleep, which I started before the therapist and the surveys. Before I ever acknowledged my depression, I acknowledged I couldn’t sleep. I was anxious all day and much worse overnight. Seroquel. They put me on Seroquel, which is normally prescribed for bipolar patients. It was sometimes prescribed off-label to treat sleeping issues. My doctor was clear that I was getting the prescription temporarily to help with sleep, not for bipolar. I can’t imagine how you stay awake with Seroquel if you’re bipolar and take it daily. I remember very little of my first night on Seroquel. I had a loft bed in my small room but happened to have my mattress on the bedroom floor that first night. I took the meds. I banged my head against the loft bed pole. I fell onto the mattress. I slept a little too well most days on Seroquel. When I moved in with Bria I changed from living near Upper Darby/Philadelphia to Morgantown, which is an hour drive from everything I knew. That hour drive tormented me on Seroquel. Bria and I drove into work together half the time during this period. Sometimes, I’d drive. Sometimes, she’d drive. Imagine yourself as Bria as the passenger while I’m driving. You look over and see my head bobbing off to the side like a storm-weary sailor lost at sea. The Seroquel was working. It helped me sleep at night. It helped me sleep during the day. It helped me sleep on my drive into work. Bria took control of our ship when we drove together from that point on. I asked the doctor for advice. Adderall is banned from my life. I get addicted easily: exercise, sparring, speeches, espresso. I try to pick habits that have benefits and low toxic potential. Almost anything is toxic when taken in extreme amounts, but “death by overindulging in water” isn’t the way I expect to go out. Adderall is different. Adderall made me feel like Superman on steroids, a Mad Hatter on too much tea. Highly focused. Highly organized. Ready to pounce on the maniacally massive and most mundane challenges. Build a spreadsheet. Got it. Code that new program. Sure. Train for a big fight. Done. Plan and organize and lead and coach and write and, and, and…whatever you want, I’LL DO IT! I CAN DO ANYTHING! Adderall was not good for me. Some might crave that high. I’m lucky to recognize that this behavior will kill me. I planned to get off the Adderall and Seroquel ASAP. After sleeping regularly for a few months, I weaned off them with minor impacts. I debated going off Wellbutrin but kept it as a safety net. I saw minimal downside and worried about changing too much too quickly in a weakened state. Still, the rollercoaster ride on meds slowly screeched to a halt. In hindsight, the therapist, survey, and meds were the major factors in getting out of my depressed period. At the time I didn’t know what was going to help, so I tried everything. I threw it all against the wall to see what stuck. I learned to act. When stuck in the anxiety loop in your own head, put your feet on the ground, step out of analysis-paralysis, walk your boots outside, and experience the world in all its magnificently mundane glory. I asked, “What excites me?” Then I experimented. Maybe all that experimenting helped because new experience seems to make time stand still like this Lifehacker article describes. Maybe it was that plus a little dopamine-rush when I was starving to feel good. Whatever the reasoning, I followed a new mantra: Act, reflect, repeat or redirect. Mostly, I repeated. So what else did I do? I walked alone. I walked with my dog, Bogey. I walked with Bria. I did dumb things to get any kind of high, not drugs, not alcohol, but a lot of online poker. I went to the bar with my buddies. I ate…carbs. Lots of carbs. I procrastinated. I ate peanut butter crackers. I searched for symptoms on the internet. I ate granola bars. I researched and read and reasoned about the root cause of my issue. I ate more carbs. I journaled. I drove two hours round trip to the Upper Darby Gym at least twice a week. I taught Bria how to lift at the Y. I tried supplements to feel stronger, more energetic. Jacked3D. I stopped halfway through my hour drive to the Upper Darby gym to use the Wawa bathroom after taking that supplement. That was a clear sign. I ignored it for months because I wanted to feel good and I was a machine at the gym afterward. I kept teaching my classes. I kept training my fighters. I sparred. I wrestled. I trained and trained and trained and trained. I found new mentors. Andy Carr was my primary boxing, kickboxing, and karate teacher. After receiving my 3rd degree Black Belt in my early twenties, Andy ordered me to go to Ventnor, NJ to see “the Ninja”. Master Mal was Andy’s primary teacher after his first teacher, Samuel Wallace. Master Mal was a Vietnam Vet POW, who looked like a cross between a fiery-red troll doll and a roadie for Van Halen. Clad in sweatpants, a bomber jacket, and a beanie, Master Mal always looked like a high-school wrestler ready to fight or a philosopher ready to pass on words of wisdom. He looked as he was. Mal’s wisdom came in short, inspirational bursts over phone calls or during a grueling training session in his tiny 12 x 12-foot ring or over lunch at the Sack of Subs during my monthly trips to Ventor to his Ninja Karate Academy. I read Master Mal’s book “Hey God – Are You Really Up There?”. If you’re ever down on life, that’s the book to read. Occasionally, you’d get a random invite to go to the movies with him. Invincible was good enough to see a second time, particularly when I needed a little extra motivation. Sometimes, you’d get the opportunity of a lifetime like when he brought a Shaolin monk to a local school to demo Tai Chi to hundreds of people. Calm. Focused. Athletic. 60-year old monk. More often, Master Mal would pump you up by challenging you to do what you don’t want to do because he knows you’ll be better off afterward. He asked me to journal. With his mental grip on me, I felt like I didn’t have a choice. Now I read about the benefits of journaling now and it’s often cited as a good technique for managing anxiety. When you journal, you capture your rapid thoughts on paper, lock them there, and throw away the key. Your mind calms. Master Mal was your safety net. He always told me I’d always have a job because I could teach karate and train people at his studio anytime. Nothing beats full confidence from a mentor when your tank is empty. Master Mal. Inspirational force. Larger than life. Ninja protector of delicate psyches. If you ever wonder why I’m nuts about my habits, remember this time in my life. Yes, I’m a bit of a robot. Part of that may be innate. Part is my reaction to my environment. Bad habits are hard to break. Individually, as one-time events, they’re not so bad. One-night gambling on poker is normally fine. Gambling every night can be a problem. The same principle applies with fighting. One night of sparring isn’t bad. A lifetime of sparring and fighting can wreck your mind. Go to a boxing event in Philly and talk to Joe Frazier. As a teenager at the Upper Darby Boxing Gym I remember serving Smokin Joe, that guy who beat Muhammad Ali once, hot dogs before I knew who he was. All I knew was I was glad we were only serving hot dogs because I couldn’t understand a word of what he was mumbling. The dopamine high from habits is a powerful force sending you in one of two directions, the grave or the moon. I know I have an addictive personality, so I’m selective about which habits I choose. I overdid it pretty quickly on espresso five years after all of this. Luckily, I recognized that one pretty quickly and drink a lot more decaf now. It took me twenty years to recognize that getting punched in the head every week probably wasn’t a good idea anymore. S – M – R – T.
Everyone’s risk/reward equation is different. Those “bad” habits can turn the trajectory of your health and potential towards the grave. “Good” habits turn your potential towards the moon. Still, you can overdo the “good” habits. Too much exercise can be bad for you. Too much water can kill you. I don’t believe in purely “bad” habits or “good” habits. Life is more complicated than labeling things purely “good” or “bad”. Finding the right balance and living with the consequences is our choice. For me, putting more of the right habits in place when I was down put me in a better state of mind. I felt better about myself from eating right and exercising. That enabled me to hear the advice I was receiving with a better outlook, more potential energy, and higher confidence. Now I use my habits both as a shield to protect against future relapses and a catapult to an extraordinary life. For you and me, that’s why I document my experiences and simplify them into the fifteen-minute versions in the Habits Guide. That’s why I keep experimenting with new habits like walking my dog with my eyes closed. You may need a shield or want a catapult. Shape your shield. Create your catapult. Experiment with a new habit today. Toss it away after a week if you don’t like it. Whether it’s one week, one month, or a lifetime habit, you’ll be glad you’re consciously creating yourself anew. Improving my habits and therapy allowed me to view myself from a different perspective. I learned life skills from Steffi. I started seeing reality more clearly. I recognized how harshly I was judging myself. I learned to be human to myself, to recognize my imperfections and place them on a shelf, stare at them, live with them. Now when I wake up in the morning, I pick one off the shelf when I want to improve. I place my imperfections back on the shelf before my nighttime workout. The physiological stress helps me disengage. I sleep well with a little compartmentalization. How did I move from high-moderate to nonexistent depression in a year? Habits, action, support. I created the rights habits to put me in a better state of mind. I acted regularly to recalibrate my perspective through therapy, measure my progress with surveys, and sleep with meds. I leaned on the support of my friends and family to recognize habits that were hurting me more than helped me. When I was down, when I was hurting, when I felt sorry for myself, the people who care about me most (Bria, Tara, Mike, Andy, Master Mal, Kevin, Rav, Scorz, Lenox, and so many more) lifted me up. The right environment, the right people gave me the strength to keep fighting. But my depression was moderate. How hard must it be for someone with severe depression? How hard is it if you’re not in the perfect environment with the right people with the right mindset of tolerance, understanding, and compassion to lift you out? I can’t answer these questions. I only know my experience. From my experience with my family and friends experiencing alcoholism, depression, or similar mental health issues, I know that environment helps. When I hear people say these things in the picture above, I shudder. Life is hard. Some people are equipped to bounce back from the lows better than others. Maybe, their brain chemistry, their thinking patterns, their social support makes it easier for them to deal with the depression-inducing drama of daily life. When I think about this now I believe the perspective that has the least downside and the highest upside is: If I’ve been in a funk for a few months, it can’t hurt to talk to an expert. If my car was running sluggish, I’d invest the money to get it checked out. I’m worth much more than my car. The big downside is to my ego. My ego will survive. The downside of not finding an expert is inadequately dealing with an issue that may drag you down, even just a little, for life. The upside is that getting expert help catapults you to living a life of your limitless potential.